This full-length pink bridesmaid dress highlights one of the top colors for 2016 – Rose Quartz! 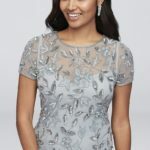 See how to style this rose quartz bridesmaid dress, plus more ideas for mauve pink and rose quartz bridesmaid dresses! Presenting another look in our hot colors for 2016, it’s one of the two top colors for the year– Rose Quartz–perfectly shown off by this rose colored hi-low bridesmaid dress from ASOS. This pretty petal-pink look seems to work with so many pastels – including the other Pantone top color, Serenity. For this bridesmaid or wedding guest outfit we were inspired by the swirl of colors in the ‘Gilded Shore’ invitations, and paired this pink with some true rose quartz pieces, some neutral tan and gold along with and some lavender and blush accents in the accessories. 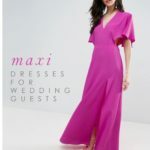 Since Rose Quartz has been in the fashion color forecast for a while, there are so many pink bridesmaid dresses to choose from this season. See some of our favorites below, and in the pink, blush and mauve bridesmaid dress shop! The shop section and shoppable images have affiliate links to our sponsors.